You have to feel a bit sorry for the organizers of the Northwest Flower and Garden Show which opened at the Washington State Convention Center in Seattle on Wednesday and runs until 6 p.m. tonight. This show, the second largest gardening show in the US, has been described as a "Disneyland for gardeners." Every February it draws people from all over the region, busloads in fact, offering a break from winter weather and a welcome bit of inspiration, reminding us that spring is on the way. But unlike years past, the opening day of the show was hardly mentioned on the local news. That day's BIG story was the Seahawks Super Bowl celebration and parade that brought 750,000 people to the streets of Seattle. I can't imagine how people working and/or attending the show on Wednesday were able to get in or out of the Convention Center. After that, it seemed like things would go back to normal. But then weather forecasters started talking about snow. A lot of us (myself included) didn't think too much about that. Snow is uncommon in Seattle in February. 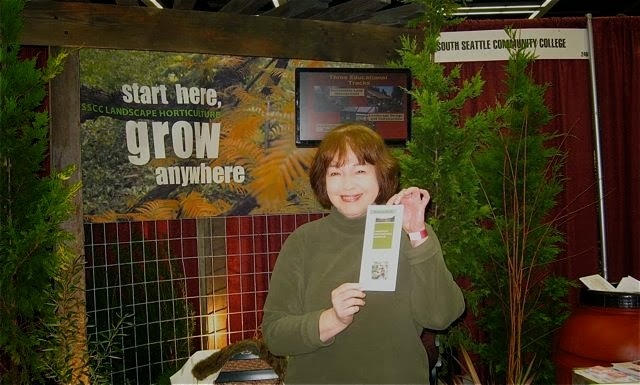 I was scheduled to work at the show yesterday afternoon, in the South Seattle Community College Landscape Horticulture booth. When I left my house for the Convention Center, the sun was out and I hardly felt like I needed a coat. My friends and I joked about the snow predictions. I worked my shift, and toured the show, delighted that it wasn't very crowded. Maybe people were scared off by the weather forecasts? If so, that was good for attendees, but not so good for show organizers. Whatever the reason, it was nice to be able to move around without encountering human traffic jams. There were some delightful display gardens this year and being able to get up close was a treat. I came home at dinnertime, the prospect of snow pretty much forgotten. But then, around 6:30, it started to snow. We got about 3 inches last night. In spite of above freezing temps during the day, a lot of snow is still on the ground. And in a couple of hours, exhibitors will start the process of breaking down the show and moving all those trees, shrubs, gardening products, structures, yards of topsoil and mulch, and gigantic granite boulders out of the Convention Center. Having been part of that process in the past, I know it isn't fun under the best of conditions. My sympathies all around. The parade and the snow storm aside, it was a great show. I hope you got a chance to attend.